Are our kids too dependent? It's great that our kids love technology, but what price does it come with? Was invited to a friend's birthday dinner last night where about 50 adults and kids were in a private room at a restaurant. The scene was set when we arrived - most of the adults were all seated together and the kids were together as well. As soon as we located some seats, my kids went and sat down. I stop and talk with some friends and then a few minutes turn my attention to my kids. They, along with just about every other kid, has their head down playing on iPhones. 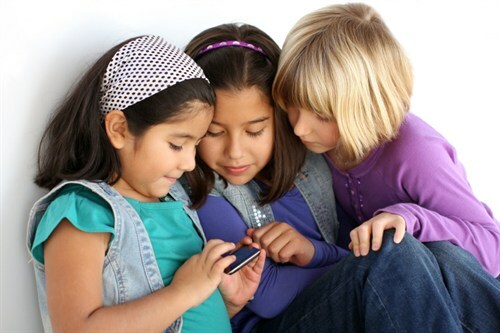 It got me thinking... how much is too much for kids to play on Smartphones? It's a fine line that we as parents need to draw. Being at a restaurant or in a public setting, kids grow restless. They aren't allowed to run around and act crazy and a Smartphone allows them to sit still. Whatever happened to drawing, coloring or reading a book? My kids had the ability to draw and color but never got them out. Many of the kids were talking back and forth, but only because they were all playing against each other in the same game? A new global study, entitled "A New Definition of Childhood by The Marketing Store Worldwide," looks in detail at the habits and attitudes of children aged 6 to 12 years old. Their findings are scary. It’s no surprise that they spend a huge amount of time online (30% of 6-year-olds spend a day a week on the computer and 21% of 6-year-olds are shopping online). Their repertoire of technology doesn’t increase with age (they start having access to devices from 6 years old)--it’s only whether they own devices personally that changes. All the birthday wish lists are exclusively around technology. The research shows they do exactly the same things on mobile phone as they do on their computers. As much as I rely on technology in my everyday life, I'm starting to think my kids are even more reliant.